The Belize National Library Service and Information System (BNLSIS) this morning awarded over $700 in cash prizes to 10 primary school students at the end of a story reading contest which they plan to take nationwide next year. The judges, Carmen Barrow, Norman Rodriguez and Joseph “Stamp” Romero, picked winners from three categories of entries after each student made their presentations at the Leo Bradley Library this morning. 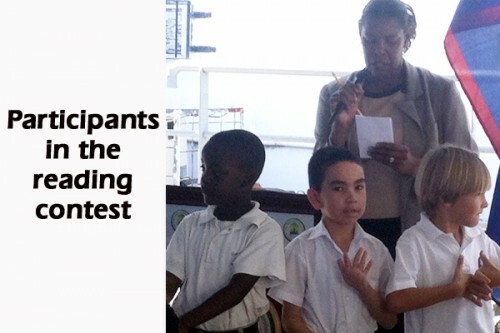 In category 1 (the standard 1 students), Maddox Heusner of Belize Elementary School (BES) walked off with the top prize of $100. Second place in that category was captured by Devaughn Abraham of Grace Primary, who won $75, and third place by Ryan Rodriguez of Wesley Lower School, who won $50. The top scorer in the category 2 group was Tessa Habet of BES. Catherine Martinez of Queen’s Square Anglican won second place, while Destinee Lopez of St. Luke Methodist took third place. In the final category, category 3, Alexie Williams of Queen’s Square Anglican took the top $100 prize, Amber Marin won second place, Chloe Auil of Holy Redeemer won third prize, and Jawaan Miranda of St. Luke’s Methodist was awarded the only fourth place prize of the contest—for which he also won $50. An official of the BNLSIS joked that the students made as much money as doctors do in that short space of time, for taking time to read in the contest.